Herbs to use in your magic at Ostara: lily of the valley, tansy, lavender, marjoram, thyme, tarragon, lovage, lilac, violets, lemon balm, dogwood, honeysuckle, oakmoss, orrisroot, sunflower seeds, rose hips, oak, elder, willow, crocus, daffodil, jonquil, tulip, broom (Scotch or Iris), meadowsweet, acorn, trefoil (purple clover), vervain. Violet, honeysuckle, narcissus, and lemon make good incenses for Ostara — the scents should be clear and light, floral and evocative, but not overwhelming or intoxicating. Herbs associated with springs include meadowsweet, cleavers, clover, lemongrass, spearmint and catnip. If you want to use wood in your spells and rituals, ash has a strong line with the equinox due to its connection with the macrocosm-microcosm concept in the Celtic ogham runes – the balance of light and dark… as above, so below. The cross represents the four seasons, or the four phases of the moon, and are on the sacrificial bread of the lunar goddesses of many cultures. They are found from Egypt to the Aztecs of Mexico. A circle with a cross (the female symbol) was often set up on top of a pillar (representing the male)-the whole representing union or fertility. It is also interesting that the biological symbol for female remains a circle with a cross beneath (the symbol for Venus). Hot cross buns were also believed to last twelve months without turning moldy, which was of great use during Pagan times when the storage of food was imperative for survival. It was believed that they would protect against evil forces and fire if hung in the kitchen. 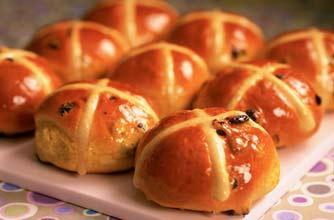 Sailors believed that hot cross buns would protect against shipwreck if taken to sea. Farmers in certain parts of England (UK) also believed that they would protect the granary against rats. This recipe will make 2 1/2 dozen buns. Have the water and milk at 110-115 degrees F. In a large mixing bowl, dissolve the yeast in the warm water. Add the warm milk sugar, butter, vanilla, salt, nutmeg, and 3 cups of the flour. Beat until smooth. Add the eggs, one at a time, beating the mixture well after each addition. Stir in the dried fruit and enough flour to make a soft dough. Punch the dough down and shape into 30 balls. Place on greased baking sheets. Using a sharp knife, cut a cross (or X) on the top of each roll. Cover again and let rise until doubled (about 30 minutes). Beat the water and egg yolk together and brush over the rolls. Bake at 375-degrees F. for 12 to 15 minutes. Cool on wire racks. Drizzle icing over the top of each roll following the lines of the cut cross. ICING: Combine 1 cup confectioners’ sugar, 4 teaspoons milk or cream, a dash of salt, and 1/4 teaspoon vanilla extract. Stir until smooth. Adjust sugar and milk to make a mixture which flows easily. Mix a few drops of vanilla into the egg whites. Dip a paintbrush in the egg whites and coat the petals. 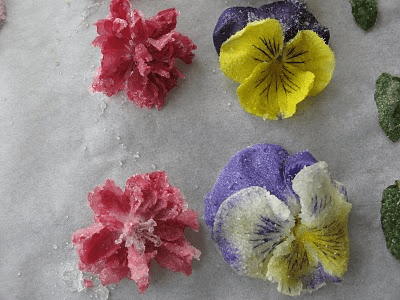 Dip petals into sugar until coated, then spread on wax paper to dry. Please be advised that you cannot use flowers bought at a florist for this recipe!! Many commercially-bought flowers contain pesticides and it is not worth it to ingest poison. Please obtain all flowers from organic retailers or from home-grown sources. These flowers may be safely eaten and are suggested for this recipe: Allium, angelica, apricot blossom, apple blossom, bachelor button, bean blossom, begonia, calendula, carnation, chrysanthemum, clover, crab apple, dandelion, day lily, dianthus, gardenia, geranium, ginger, gladiola, hibiscus, hollyhock, honeysuckle, hyacinth, jasmine, johnny jump-up, lavender, lilac, lily, marigold (the calendula type only), monarda, nasturtium, orange blossom, pansy, peach blossom, pear blossom, peony, plum blossom, primrose, rose, snapdragon, squash blossom, strawberry blossom, tulip, viola, violet, and yucca.